Friday - Saturday: 12 midday to 10:00pm. We have a private onsite Car Park behind the Hotel that diners visiting the Cafe Bar Concerto can use. The Car Park has 60 spaces and is free to use for Guests. The Cafe Bar Concerto is located close to a bus stop, and is only a short journey away from the Doncaster Train Station. Throughout the day our television screens play a delightful variety of black and white movies from the traditional golden era of Hollywood, whilst soft swing music sets the atmosphere throughout the Restaurant. On select days we also host Cabaret evenings. If you are celebrating a birthday, anniversary or any other special event, then please get in touch by calling 01302 361371. As well as the Cafe Bar Concerto, the Hotel has a number of private function rooms available to hire for private dining. For private bookings in the Hotel we can offer a buffet, sit down meal or Afternoon Tea. 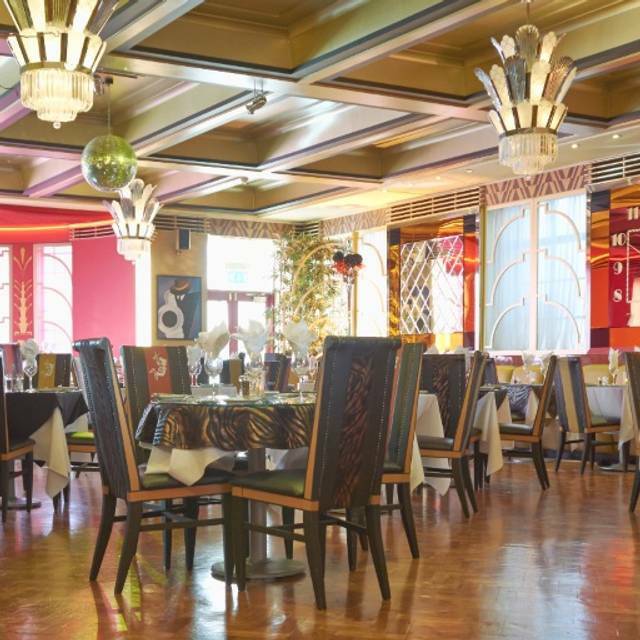 The stylishly art deco Cafe Bar Concerto is situated within the grand surroundings of The Earl of Doncaster Hotel. With its glass paneled Cocktail Bar and sunburst glass chandeliers, the restaurant offers a truly unique dining experience. Specialising in modern cuisine, the Cafe Bar Concerto offers Lunch, Dinner and Afternoon Tea alongside as well as an excellent drinks range including Lagers, Beers, Spirits, Wines, Champagne and Prosecco. It was our anniversary and we choose here because staff there did a wonderful job at our daughters wedding last year. The food was good overall although if you had s large appetite you may find the portions on the smaller side that said the food was very tasty. The staff were very attentive, they wished us a happy anniversary on sitting us down then wrote it on a plate and presented it us with goodies on it at the end of the meal. Beautiful surroundings, a truly lovely experience. Service excellent afternoon tea not amazing, dried up sandwiches and and poor choice of fillings although we were allowed to request extra vegetarian ones. At £17.95 per head it should have been amazing. We booked a table for lunch. When we arrived we were immediately shown to our table by a lovely waitress. Unfortunately it went slightly down hill from there. We were the only guests in the restaurant and yet it still took 50 minutes for our first meal to arrive. The staff were apologetic but then when the meals arrived we found a hair in the food. Slightly disappointed as we had this arranged for a while and was looking forward to it. Due to this experience, we unfortunately would not visit again. Met here for afternoon tea with friends. Excellent choice of afternoon tea available and when it came it didn't disappoint. The food was amazing and the service was outstanding. We were asked several times if we were ok and were made to feel like royalty. A most enjoyable experience in beautiful surroundings with the art Deco furnishings. Will definitely be returning in the future! I would highly recommend you avoid the earl if you're looking to enjoy your evening. We booked a table for 6 people to celebrate a 60th birthday. We arrived at 20 minutes early, made them aware we'd arrived & had a drink in the bar, we were slightly unnerved by the lack of people dining on a Saturday evening.... & now we know why! We were asked at 7.45 if we were ready as the kitchen was closing at 8! So we were shown to a table in the near empty dining room, we ordered & this is where the whole evening took a nose dive.... 4 of our party ordered & after a rather long 40 minute wait were delivered a plate of food that was cooked & reasonably edible, the other 2 of us had ordered fillet steak (rare) & this is where the evening unraveled a lot faster than the food was being cooked. Now I like my steak rare but not raw & chilled in the middle so we asked for it to be re cooked, they sent out two more again after a wait longer than the cooking of a rare steak in an empty restaurant & somehow had managed to show the steak to the cooker for even less time than the previous ones! Again we complained to the waitress who told us that is definitely what a rare steak is like (I've had steak tartare that's seen the heat longer than that steak had!!) so in comes the manager who tried to convince us it was definitely rare & rare steak will be cold! We gave up returned our full plates & he ever so kindly removed them from the bill!! My advice stay home & order a pizza, saves having to order one on your way home! Lovely afternoon tea in great surroundings. Price ok although have had better value in other tea rooms. Would return for the nostalgic decor which is probably reason for price. Thanks, will see you again. Service was slow but friendly. Food average but wide range of meat if you like that kind of thing - kangaroo! Bar closed before 11pm in a Saturday night?! We were really sorry that we had to leave. We didn't realise that is was St Leger Racing week. The restaurant bar was full of rowdy people who had clearly had a lot to drink. It made the ambience unrelaxing/uncomfirtable. We purposely asked to be seated the furthest away from the bar but still couldn't hear each other talking, so we decided not to dine there. Went for tipsy afternoon tea on saturday as a treat for my mums birthday. Food was delicious. Plenty of different treats. We had several refills of prosecco and my son was very pleased with his hot chocolate. Would 100% reccomend and cant wait to come back. The art deco theme was adorable. The old movies on the tv a wonderful touch. My 74 year old mother started telling me about my grandmother who was very much a 1920s 1930s kinda girl and stayed that way until her sixties. It was a lovely afternoon. Unfortunately I knocked one star off because the atmosphere was ruined by modern music being played constantly throughout our two hours there. I'm sure Kylie and Madonna weren't around in the roaring twenties. Food is excellent and lots of it. They gave me an excellent vegetarian alternative when I asked at short notice. Just a real shame about the music. We have been to this restaurant fairly regularly but were very disappointed this weekend. There was quite a roudy group at the bar. We ordered and the 8oz fillet steak was over done and small. When we complained it was taken back to the kitchen and we were given a complimentary glass of wine. I still had my meal. Another steak did not come until 20 mins later so we both felt like we had eaten on our own. It is very quick to cook a medium steak! The restaurant was not busy so I could not understand the delay. I complained when we received the bill and had 20% knocked off the bill. As our night was completely ruined I thought this was quite an insult. I love the decor- Art deco which is why we usually go but after that experience we will not returning for some time if at all. The food was poor and cold. Pan fried sea bass turned out to be one fillet (i.e. 1/4) of a fish. The portion was derisory for the price. It was accompanied by a stale potato rosti, veg and salad - an odd assortment. The pork steak was grisly, the lamb shank cold and the burger over cooked. Additionally service was slow and inept and yet the meal was expensive for what was served. I shall not eat there again. The staff were friendly, polite and efficient. The food was well prepared. The Art Deco design of the whole building made the evening a different experience - unlike that in a corporately styled pub, modern hotel or fast food outlet. Overall very pleasant and reasonably priced.